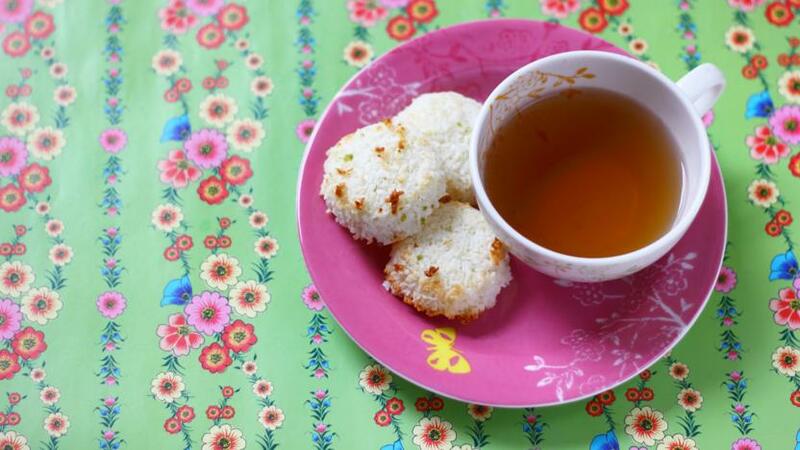 These coconut macaroons are gluten-free and very tasty. They're easy to make so great to do with kids. Not to mention a delicious way to use up leftover egg whites. Use your hands to mulch the egg whites, sugar, coconut, lime zest and juice in a bowl until they lightly come together. With wet hands, press the mixture into a flat, square shape about 1cm/0.5in high. Use a small upturned liqueur glass to cut out small rounds, and place on a lightly oiled or nonstick baking tray. Bake for 12-15 minutes in the centre of the oven until very lightly golden, just touched with colour. Cool the macaroons on a wire rack, and store in an airtight jar.